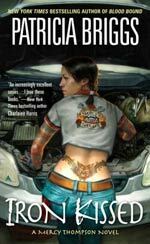 Mechanic Mercy Thompson can shift her shape – but not her loyalty. When her former boss and mentor is arrested for murder and left to rot behind bars by his own kind, it’s up to Mercy to clear his name, whether he wants her to or not. Mercy’s loyalty is under pressure from other directions, too. Werewolves are not known for their patience, and if Mercy can’t decide between the two she cares for, Sam and Adam may make the choice fir her…. Iron Kissed is the third book in Patricia Briggs’ Mercy Thompson series. 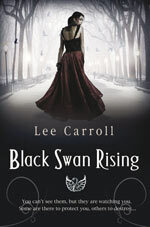 Whilst this novel is part of a series, it is also a stand alone story, and as such in isn’t necessary to have read the previous novels first before reading this one – although you might want to because both Moon Called and Blood Bound are both exceptionally good contemporary fantasy novels. Moon Called introduced readers to Mercy, who is a Native American supernatural called a walker which means she can shapeshift into a coyote, see ghosts and resist magic. It also introduced us to her werewolf centred world. In Blood Bound, readers saw Mercy slay a demon possessed vampire and save the Tri-Cities from a wave of demon-spawned violence. Readers were also given tantalising hints that her walker powers enabled her to slay vampires making her a natural enemy of vampires everywhere. Iron Kissed sees Mercy out to help her friend Zee, who is a fae. First Mercy is asked to sniff around (literally) the scenes of several unsolved murders on the fae reservation. She soon sniffs-out the perpetrator but that only the start of her troubles, as the murderer quickly ends up dead and Zee gets accused of killing him. Ignoring all the warnings to stay out of fae business, Mercy is soon on the trail of the real killer as she starts to follow a trail of stolen magical items that someone thought it worth killing for. Iron Kissed concentrates completely on the fae with a little werewolf pack business thrown into the mix. Strangely, after the vampire-centric events of Blood Bound, there are no vampires at all in this story. Even Mercy’s vampire friend Stefan is conspicuous by his absence. During Blood Bound it looked like Stefan was shaping up as another possible romantic interest for Mercy but the author seems to have shied away from this idea and it isn’t clear if Mercy even likes Stefan as a friend anymore. Still, there is plenty else going on in Mercy’s love life that she didn’t really need another potential suitor. She has two alpha werewolves to choose between, and she finally does make her choice and resolve the situation between them in Iron Kissed. I think this is where I felt a little let down by the novel. After reading the previous two novels, where Mercy really couldn’t pick between Sam or Adam, the situation finally gets resolved within a couple of pages and it seems like something of an anti-climax. Now, while I am happy that Patricia Briggs doesn’t write in the style of Laurell K. Hamilton and that I wasn’t subjected to an Anita Blakesque bonk-a-thon while Mercy made up her mind, I did think that the quick resolution of the relationship issues made the whole Sam/Adam plotline seem a little pointless. Iron Kissed is by far the darkest novel in the series so far and parts of the story towards the end make for compelling, if uncomfortable, reading. The book also has everything that readers of the Mercy Thompson books have come to expect – a fast-paced, well plotted mystery storyline, engaging characters and richly imagined fantasy/mythology. 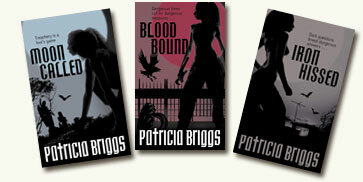 The Mercedes Thompson novels by Patricia Briggs are published in the UK by Orbit (UK covers pictured above) for release June, July and August 2008.